Published in collaboration with Arts NK. This exhibition is the culmination of a photography project by the residents of Branston. It is a celebration of the good things about living here and the people who are special to us. Residents of all ages have taken photographs of what is specifal to them in Branston and in doing so have given a unique insight into life in this beautiul Lincolnshire Village. This project is supported by Arts NK as part of the delivery of the arts programme for North Kesteven District Council, through Leisure Connection. For more information on this or any other photographic projects contact Jane Harrison Photography Development Office, Arts NK, The Hub, Sleaford. Tel: 01529 411192. A Collection of copies of old photographs and post cards, published in collaboration with Arts NK. 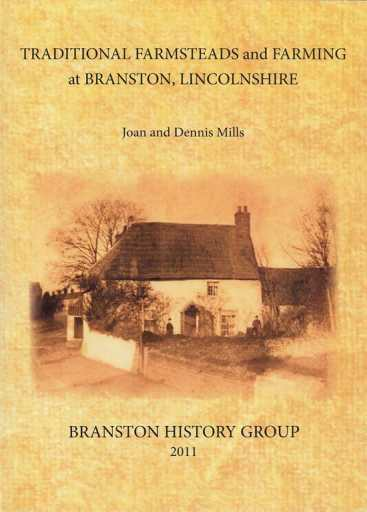 This is a new booklet published in 2011 by the Branston History Group, the booklet has been written by Joan and Dennis Mills. The preparation of this booklet has involved many very willing people, living both in Branston and elsewhere, and it literally could not have been written without their help. Branston History Group provided an audience on three evenings in the winter of 2010-2011 and distributed drafts of our scripts for discussion. This generated informed interest leading to extra information, different ideas and perspectives and offers of access to key premises. Committee members also read and commented on the penultimate draft. The booklet helps to shed light on the farming families and the farmsteads with pictures, maps and familyÂ stories.